WHEELS: 18" X 7.5" POLISHED SATIN CARBON (STD), TRANSMISSION: 6-SPEED MANUAL (NSG370) (STD), TRAILER TOW GROUP -inc: Class II Receiver Hitch, Trailer Tow w/4-Pin Connector Wiring, QUICK ORDER PACKAGE 23G -inc: Engine: 3.6L V6 24V VVT, Transmission: 6-Speed Manual (NSG370), MANUFACTURER'S STATEMENT OF ORIGIN, HEATED FRONT SEATS, ENGINE: 3.6L V6 24V VVT (STD), BLACK, CLOTH BUCKET SEATS -inc: adjustable head restraints, BLACK 3-PIECE HARD TOP -inc: If ordering without AEM (Dual Top Group), the black soft top will not be included, Rear Window Defroster, Delete Sunrider Soft Top, Freedom Panel Storage Bag, Rear Window Wiper/Washer, BAJA YELLOW CLEARCOAT. 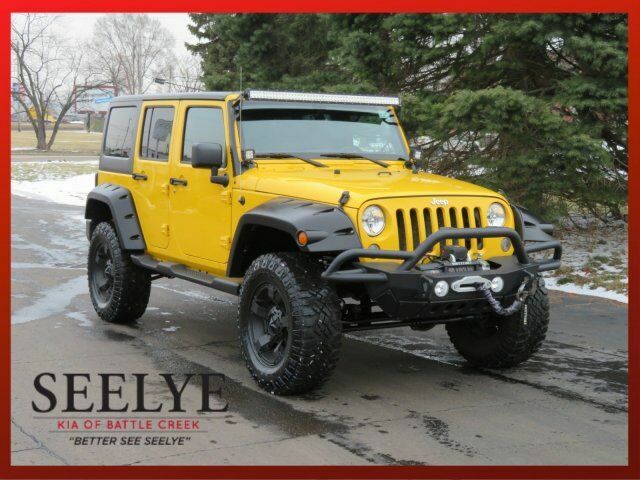 This Jeep Wrangler Unlimited has a powerful Regular Unleaded V-6 3.6 L/220 engine powering this Manual transmission. 3.21 REAR AXLE RATIO (STD), Wheels: 18" x 7.5" Polished Satin Carbon, Variable Intermittent Wipers, Trip Computer, Transmission: 6-Speed Manual (NSG370), Trailing Arm Rear Suspension w/Coil Springs, Towing Equipment -inc: Trailer Sway Control, Tires: P255/70R18 OWL On/Off Road, Tailgate/Rear Door Lock Included w/Power Door Locks, Sunrider Soft Top, Single Stainless Steel Exhaust, Side Steps, Side Impact Beams, Sentry Key Engine Immobilizer, Removable Rear Window, Remote Keyless Entry w/Integrated Key Transmitter, Illuminated Entry and Panic Button, Rear Cupholder, Rear Child Safety Locks, Radio: Uconnect 130 AM/FM/CD/MP3, Radio w/Clock and Steering Wheel Controls. As reported by KBB.com: Not only will the 2015 Jeep Wrangler let you take the road less traveled, it will let you take no road at all if you prefer. If you want to go even farther, an ample aftermarket is ready to step in.